Leaving aside the sad slate from last weekend, September proper jumps right into some franchise action, as it's become a safe/popular time to release horror films, though there's little chance of a repeat of last year's earthshaking performance of IT. The Nun is the fifth film and the third branch of what's now become known as The Conjuring Universe, a family of films made under the umbrella of Saw-maven James Wan, surrounding stories related to, directly and tangentially, to real life paranormal investigators Ed and Lorraine Warren. This is the second spin-off about the central demon Valak in the series of films, after Annabelle, and goes back in time to the 1950s. After the death of two nuns in a convent in Romania, a priest and a young novice are sent from the Vatican to investigate, suspecting the paranormal. This presence is seen in the form of a disfigured and grimacing nun, who seems to have aims at more than just ordinary homicide – possession is the name of the game. The two emissaries then do battle with this spirit and spooky jump scares in poorly lit corridors ensue. Maybe bring a lamp? Mexican actor Demian Birchir stars along with Taissa Farmiga who the alert among you might recognize as the sister of The Conjuring's main character, though this seems to be not hinting at any direct connection here. Each of the Conjuring movies so far has opened to at least $35 million, though there's been a slight downward trend and a preference by audiences for the main branch of the tree rather than the spinoffs. 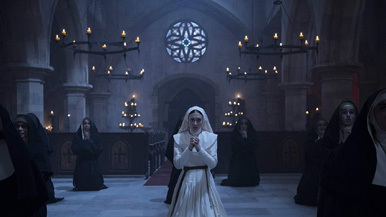 The Nun has a pretty straightforward presence – there's no buy in on a haunted doll, for instance – and effective ads, so this could reverse the trend a bit. However, as budgets for these films hover in the $20-40 million range, there's virtually nothing stopping them from being wildly profitable. This looks to be entirely within the pattern of what audiences are looking for from these films and should open to around $37 million.